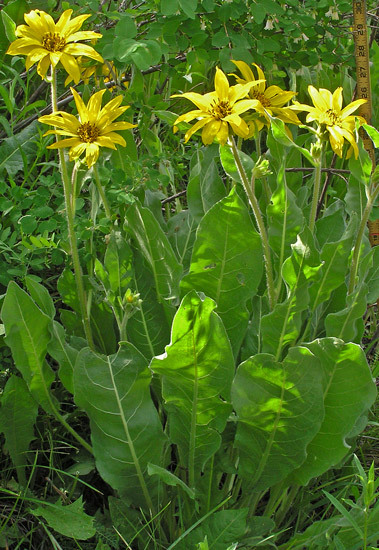 The two species of Mule's Ears shown below are very showy and often cover many acres of low montane meadows with large, bright orange/yellow flowers. 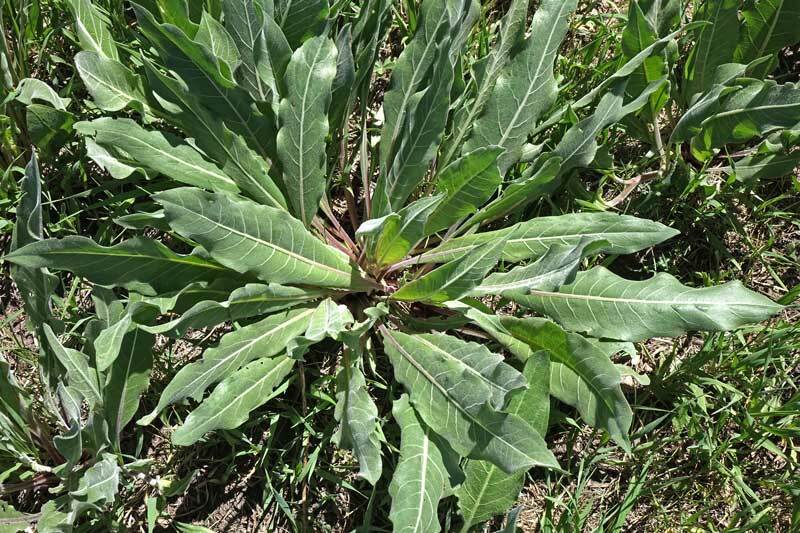 Mule's Ears might be confused with its close cousin, Arrowleaf, but the leaves of the two are quite different: Mule's Ears leaves are two-to-four inches wide and up to a 16 inches long; Arrowleaf leaves are about four inches wide and six-to-nine inches long and arrowhead shaped. 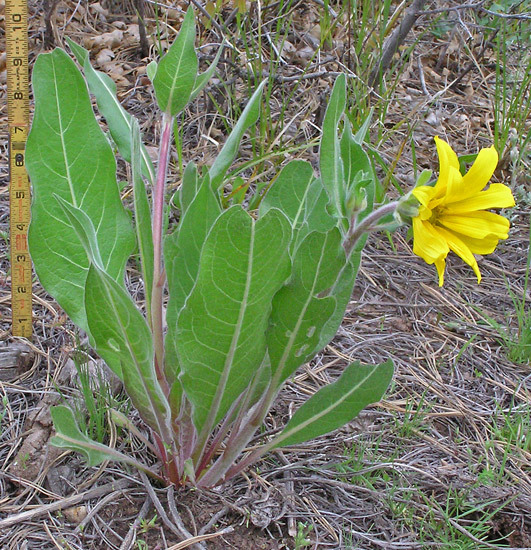 The Mule's Ears plant is usually several inches taller with larger flowers. 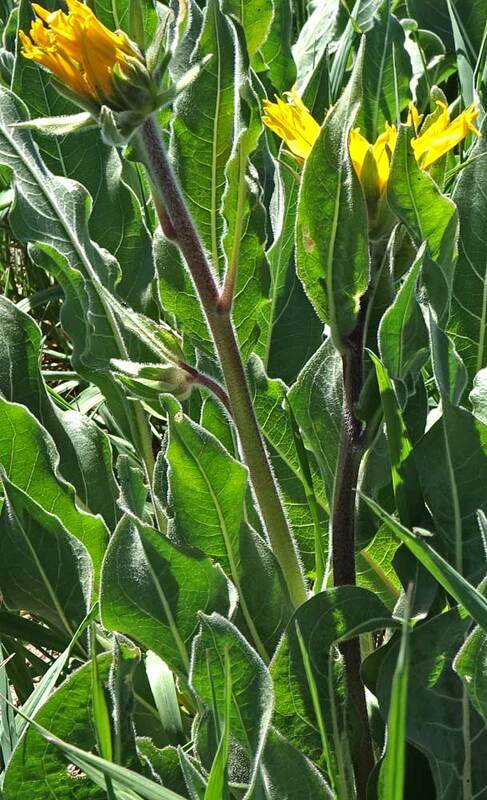 Mule's Ears usually blooms several weeks after Arrowleaf. 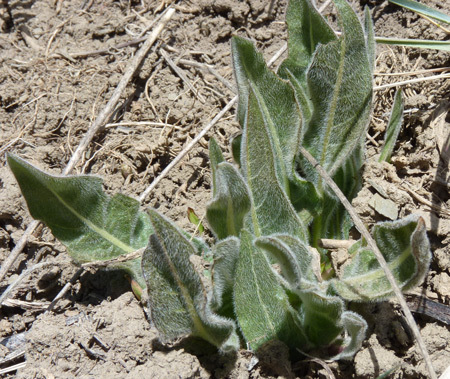 The first species shown below, Wyethia arizonica is quite hairy and its leaves are usually on long petioles. 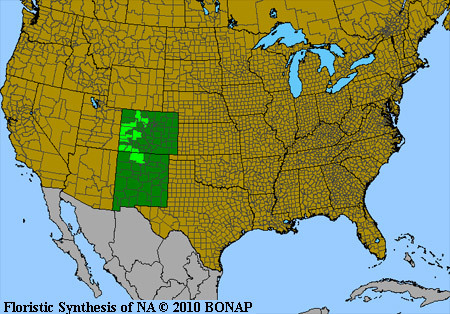 According to Weber, this species hybridized with Wyethia amplexicaulis, a species not now found in the Four Corners area, but found here during the Pleistocene. This cross produced the stable hybrid, Wyethia x magna, still a common species of the Four Corners area. It has characteristics of both parents and usually has smooth, hairless leaves that clasp the stem. Montane. Meadows, openings. Spring, summer. Lone Mesa State Park, July 3, 2011; and Echo basin Road, June 15, 2017. 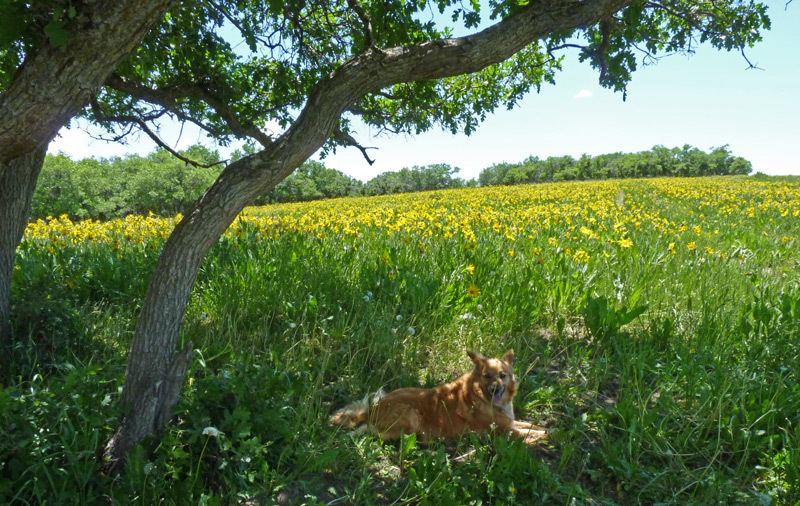 Wyethia arizonica spreads over thousands of acres in the Four Corners foothills with large golden flowers and a special sweetness that fills the air. Near Narraguinnep Natural Area, May 19, 2007. Wyethia arizonica has very hairy stems and leaves. It grows from eight to thirty-six inches tall and sports very bright, very large flowers for a number of weeks. Petioles of basal leaves are often nearly as long as the leaf blades, but those of the upper stem leaves can be quite short. 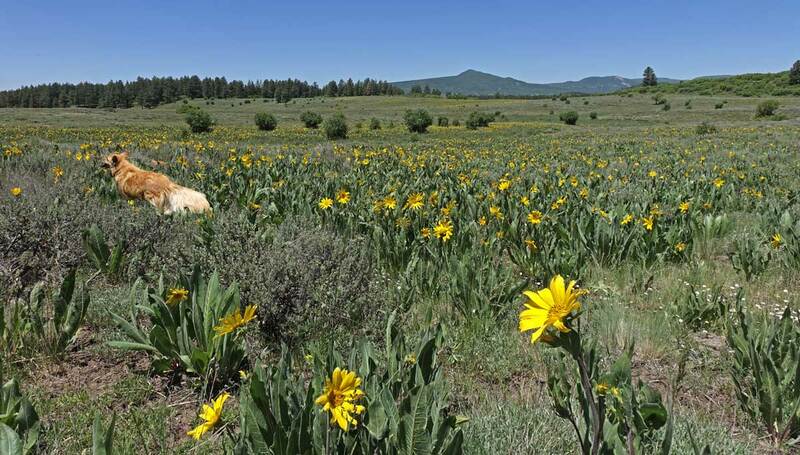 Wyethia arizonica can form very extensive colonies of hundreds, or even thousands, of plants on open, sunny hillsides or it can be, as pictured at left, scattered in Aspen and Ponderosa woods. 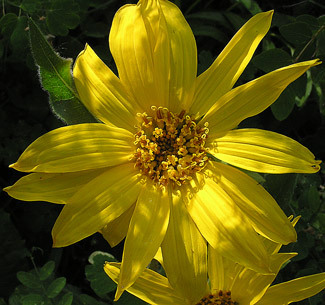 The Wyethia genus was named in 1841 by Thomas Nuttall for his friend Nathaniel Wyeth, Boston hotelier and ice-making entrepreneur, who collected the first species of this genus (Wyethia amplexicaulis) in Idaho in 1833. Asa Gray named this species from a specimen collected by Palmer in Arizona in 1869. Near Lone Mesa State Park, May14, 2014 and June 15, 2016, Near Narraguinnep Natural Area, May 19, 2007, and Echo Basin, June 15, 2017. 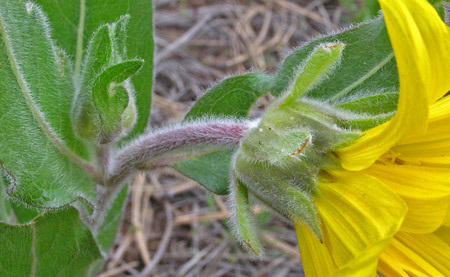 The hairiness of Wyethia arizonica is evident in the minute three inch leaves in the top photograph at left and in the fully developed plant along the flower stem, on the phyllaries, and on the leaf surface. Flowering stems are commonly red. 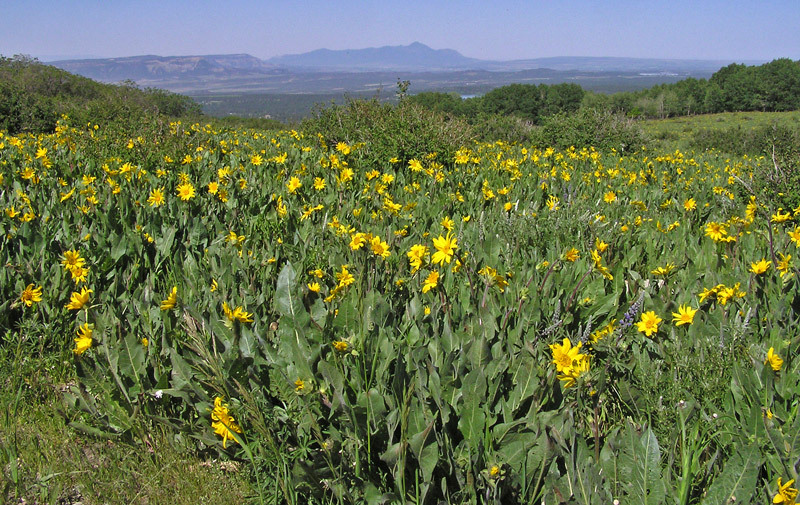 Mule’s Ears are abundant and conspicuous, sometimes growing in colonies covering many acres. 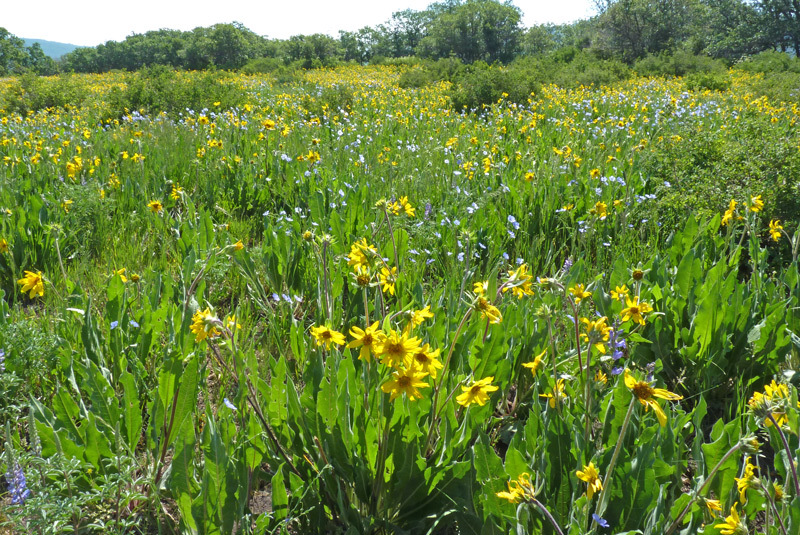 Mule’s Ears prefer meadows but are also found in forest openings. The long, narrow leaves provide the common name. 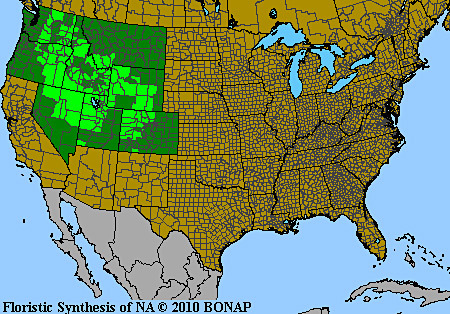 The hybridization (the "cross" or "x" ) of W. amplexicaulis and W. arizonica produces W. x magna. 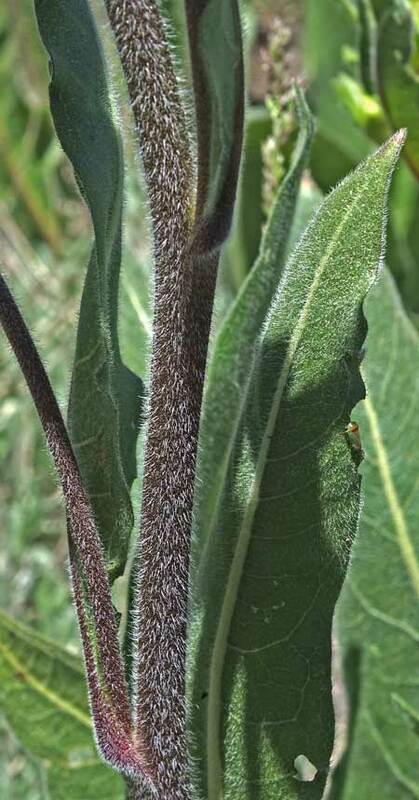 All three species are very similar in appearance but W. arizonica has very hairy leaves and stems, W. amplexicaulis is smooth, and W. x magna can be either.